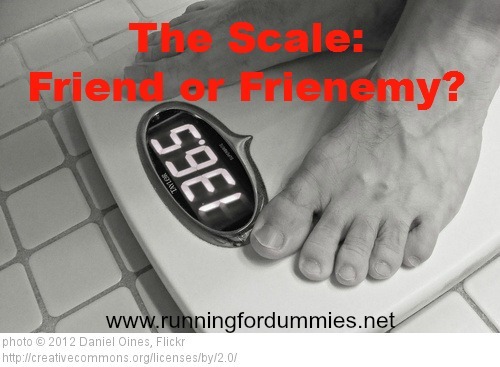 RUNNING WITH OLLIE: The Scale: Friend or Frienemy? How does an inanimate object evoke so much emotion? Does the scale control your emotions? Does a number define you? Take the Scale Personality Test. D. All of the above and also after every bowel movement. What Emotion does the scale most often evoke? A. Indifference. The scale does not rule my emotions. A. Nothing that I don't already know. B. Whether or not I ate too much yesterday. C. Whether or not I am due for a bowel movement. D. Whether I am skinny or fat. B. How my clothes fit. C. How I feel / How I look in the mirror. D. The # on the scale alone. Mostly A's: Congratulations, you have a healthy relationship with the scale. You keep in touch, but you don't let it get too close to your emotions. Your scale is your friend with benefits. Mostly B's: Good job, you are friends with the scale, but it doesn't rule your life. It is OK to love the scale, just remember to not get too close. Mostly C's: You have a love affair with the scale, just be weary of its potential to turn on you. One day a happy relationship, the next day your best frienemy. Mostly D's: You are in the danger zone. You are emotionally attached to a partner (the scale) who can't give you what you need. Learn to separate your self worth from a number. This is a one sided relationship that won't go anywhere. This is the song you should sing to your scale. The Kills: The Last Goodbye. Please remember there are many ways to measure progress, all of which can exclude stepping on a little box in your bathroom that produces an arbitrary number. B. How you look in the mirror. C. How your clothes fit. E. Your body fat %. F. Your blood pressure / your overall health as determined by your doctor. What is your relationship with the scale? I rarely weigh myself. I can tell if I have gained weight without the scale's help:) plus during certain times of the month I have to give myself a bit of grace. I don't have a scale... occasionally I pull the wii fit out from under the tv and weigh myself via it.... usually it says something it's been 72 days since my last weigh in. I'm not interested in losing poundage tho... more in to how I feel, so the scale never been a big thing for me! I don't usually let the scale affect me, but I did on Friday. I could not figure out why I was 3 lbs heavier than Thursday. I fluctuate a lot, but I could not figure it out. And yesterday, I had a 'revelation'...We went to the movies on Thursday and I had some (ok, more than some). Sodium! Right! !